This dentistry investigative report - this time in Canada - is modeled after the one done in the USA and published in Reader's Digest many years ago. Go ahead and watch the video, which is here. 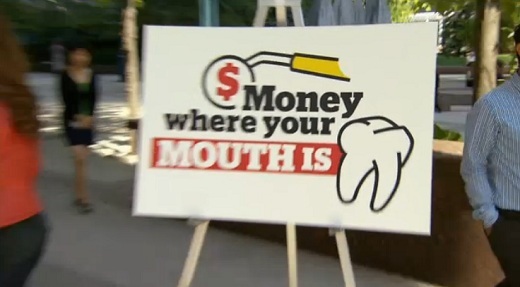 In "Money Where Your Mouth Is," Marketplace sends a researcher with hidden cameras to 20 different dentists in Toronto and Vancouver. We want to know: what treatments are recommended for her pearly whites? We discover a wide variation in treatments and costs. It seems dentistry is not that black and white after all -- there are various shades of grey. Marketplace wants to know why -- to get answers for the millions of Canadians who visit their dentist every year. Back in the 1990's, I thought the Reader's Digest piece was media sensationalism and a nefarious set up at best. However, after working as a locum tenens dentist in many practices since, I find "overselling" an all too common practice. The profession of dentistry needs to get back to health care and leave the selling to the used car salesmen. Unfortunately today, you often cannot distinguish between the two.